I admit it, I made heavy weather of this book. I was entranced by the quirky humour of Peter Carey’s early work, Oscar and Lucinda and Bliss, and quite enjoyed The Tax Inspector and Jack Maggs, but his subsequent books have failed to interest me at all. I’ve bought first editions of most them (including True History of the Kelly Gang which won the Booker and the Miles Franklin and the Commonwealth Writers Prize) because Carey is after all, Australia’s most famous literary export and people say he could be in line for the Nobel Prize. Carey was a nominee for the Man Booker too, but missed out to Ismail Kadare, who writes terrific books with significant political undertones. I really enjoyed The Siege (see my review) and The Palace of Dreams, and have The Concert nudging its way along the TBR, but I digress. Anyway, despite Carey’s fame, my first editions sit pristine on the TBR. I feel mildly guilty and unpatriotic about this so have borrowed a couple of audio book versions in an effort to trigger some enthusiasm but no, it didn’t work, and I took those back to the library unfinished too. When Parrot and Olivier in America came out I didn’t buy it because I decided it was silly to spend money on a book I knew I wasn’t going to read even if it was conceivably an investment. So when it was nominated for the Miles Franklin I had to borrow a copy – but sent it back unread after the first few chapters, and I was peeved indeed when this title was chosen by poll for our ANZLL schedule this year! There are heaps of glowing reviews out there: the SMH, the NY Times, the New Statesman so I’ll content myself with explaining why I didn’t like it. Remind you of anybody? Christina Stead in a good mood instead of a temper?? Elfriede Jelinek without the angst?? This piling up of images in a helter-skelter of tumbling words is very cleverly done, and it’s a style that is admired by Those in the Know. It’s witty, it’s effective and sometimes poignant – but it’s just not to my taste. I got sick of it. There’s nothing new about having a go at America for its materialism; D.B.C Pierre did it to comic effect in Vernon God Little and American authors themselves have been mining that theme for decades. But, for all that the reviewers find ‘sparkling’ and ‘witty’ about the fledgling American democracy in Parrot and Olivier in America, to me the book seemed to have a hollow core. I think Carey wasted an opportunity here to beef up his Nobel and Man Booker credentials by exploring the pros and cons of American democracy in a more intellectually rigorous way. He has a lot of fun playing with his characters but there’s no substance to his critique. Read Balzac, an unreconstructed Royalist forever trying to come to terms with the French Republic and although you may not agree with his politics you have to acknowledge the validity of his arguments. He’s no fool about the excesses of the monarchy but time and again his stories show the venality, corruption and greed of those in power who replaced it. Time and again he shows that the ordinary Parisian is no better off. His perceptive analysis about the temptations of human nature make him wary of power and money, and taken as a whole La Comédie Humaine is a pessimistic reminder that society needs checks and balances to protect the vulnerable. 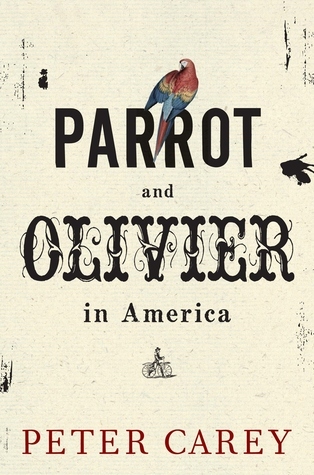 Perry Middlemiss has just posted on Matilda that Parrot and Olivier in America was judged Best Book for 2010 by The Economist and by Publishers Weekly. .. I had forgotten that Kevin from Canada had reviewed this book when it made the 2010 Booker Shortlist – he had reservations about it too. Like you I did like some of Carey’s early work including “Oscar and Lucinda”, “Bliss”, and “The Tax Inspector”. “The History of the Ned Kelly Gang” seemed quite ordinary stuff to me, and I haven’t read any of his novels since. I’ve been tempted to read his art books like “My Life as a Fake” and “Theft”, but haven’t had any desire to read “Parrot and Oliver in America”. Guess I’ll forget that one. I have to admit that I haven’t rushed out to read this either. The only Peter Carey book I have ever enjoyed was The True History of the Kelly Gang. It was amazing and had me from beginning to end. I was never able to finish Oscar and Lucinda and more recently I read The Unusual Life of Tristan Smith which was interesting but a bit bizarre for my tastes. I know Carey is a great writer, but his books are a little boring for me overall – a little too high brow perhaps. I always get the sense when I read his books that he thinks a little too well of himself if that makes sense. Lisa, I agree so much with what you have to say. Carey seems to bask in his own glory at times – to the detriment of his work. However, I loved and savoured “Theft” – beautifully written and a sort of Australianism captured that left me breathless and nostalgic for the country towns I have not been to for years. It is not a long novel… Try it, to regain your awe for his plotting and wordplay? Yes, yes do it, you may be enchanted, as I was! LOL Lisa, at least you gave it a go. I love really spare writing as you know, and then at the other end I can get a real kick out of exuberant larger than life books like this and another you didn’t like a lot, A fraction of the whole. It’s not the sort of book, I think, in which you become emotionally engaged with the characters but I enjoyed it more than I expected to and perhaps that’s partly due to having lived in the US a couple of times and so enjoying seeing how Carey dealt with many of the issues we’ve noted and discussed (with Aussies and Americans) as the result of those stays. I could second every one of your critical observations, Lisa — this novel struck me as a virtuoso performance of missed opportunities. Carey seems to approach a subject that would be worthy of more intensive examination and then, in a flurry of metaphor and description, moves onto something else. For me that turned both characters into voyeurs. Hello Kevin – thanks for your comment (I’ve added a link to your review above) it’s interesting to speculate about why Carey might have missed those opportunities. Did he feel hesitant to tackle them because even after 20 years in the US he doesn’t feel confident about discussing the pros and cons of democracy as it is practised there, or because the geo-political issue of America promoting democracy through its wars is too controversial? Or is just that he has an uncritical view of US democracy? Here in Australia there are regular debates about the balance of executive power and the demos. A referendum to introduce a widely supported repulic failed here because some supported a model with an elected president while others fear the Celebrity President and wanted one chosen by a process similar to the one currently used to select our Governor-General. Citizen-initiated referenda has its adherents; others see this as demagoguery gone mad. Here we cherish the independence of our publc service and find the idea of elected fire and police chiefs bizarre. In Britain there are regular debates about their first-past-the-post voting system compared to a preferential system like ours. Without knowing much about US politics, and certainly not wanting to turn Carey’s novel into a political treatise LOL, I think Carey could have played with these ideas fruitfully. My guess is that Carey is more a story-teller than he is an analyst of political trends — he mixed the two up in this book as far as I am concerned. I do appreciate his ability as a storyteller. Like Tony in his comment above, my favorites of his are his art novels, but that is because I know that world (and he does it well). I think when he casts too broad a net he just backs off the bigger themes. And, to go back to your original post, I don’t think he will ever be a Nobel contender for exactly that reason — they like big-picture angst, not carefully developed stories. Well, I don’t know. As an Australian who has lived in the US on two occasions, I thought he teased out several ideas without being overly didactic. I don’t know that his aim was to analyse political trends so much as to ponder what it is that has made America, particularly through the ideas of de Tocqueville. I enjoyed the way he played with the very ideas which intrigue me about the country, the way he showed its paradoxical nature, the fact that the very nature of democracy can somehow defeat itself. Olivier, for all his elitism, sees that – sees what its reliance on the lowest common denominator can do – while Parrot sees the opportunity it offers. In other words, I saw both admiration and criticism in the book. I have not had any inclination to read this one, even though I’ve got a copy in the TBR (courtesy of the publisher), and your review has just confirmed my opinion that’s it’s probably not the book for me. I have a love/hate relationship with Carey. I loved Oscar & Lucinda (indeed, one of my favourite books of all time), Jack Maggs and Theft. But I never finished Illywacker and couldn’t make it through True History of the Kelly Gang. PS> This comment comes courtesy of a stolen wifi connection — I’m sitting in Gloria Jean’s having a delicious flat white and staying out of the rain! It’s curious, isn’t it…these comments vary so much in terms of who liked which books. PS We *do* make excellent coffee in Melbourne – thanks to all those postwar Italian migrants who taught us how it should be done! Isn’t it mid-summer there? Shouldn’t you be having frappes or something like that? I say that because it is -25C where I am today and, floods or not, Australian January is appealing. The area under water in Queensland is bigger than France and Germany combined, see http://www.msnbc.msn.com/id/40858188/ns/world_news-asia-pacific/ and Brisbane, the capital city of Qld, is under siege from the waters with 9000 homes expected to be under water when the waters peak over the next 24-36 hours. The whole state is under a State of Emergency, and northern New South Wales is under threat as well. Thank you very much for your less than enthusiastic review of Parrott and Olivier. There are some book reviews (and here I refer to The New York Times and The Guardian) that make one doubt one’s literary judgment. I hated the first 100 pages of Carey’s book. Florid, overwrought, verbose, arrogant in Carey’s judgment that the reader would enjoy reading three, or even five, modifiers when the right one (which he seems unable to identify) would have done the job. Send that man a Strunk and White, overnight delivery! As a teacher of composition, I would have brandished my red pen mightily and set him to reading Orwell, Spark, Bainbridge, Fitzgerald (either Penelope or F.Scott). I beg those of similar opinions to comment so that I do not feel so lonely in my minority. Now don’t let Parrot and Olivier put you off. Carey’s early work is much more interesting, and much more fun. One of these days I’ll get round to rereading Oscar and Lucinda which won the Booker and is my favourite, so I really should have a review of it here on this blog. I should also get round to reading The True History of the Kelly Gang which has been on my TBR too long!